On the day of Pentecost, Jesus sent the Holy Spirit and power to his followers. So dawned the church age. Led from then on by His Spirit, believers blazed a trail through a dangerous maze of pagan cultures and religious legalism. The gospel spread like wildfire through the known world, bringing salvation to an entire generation and trial and triumph to believers of the Way. 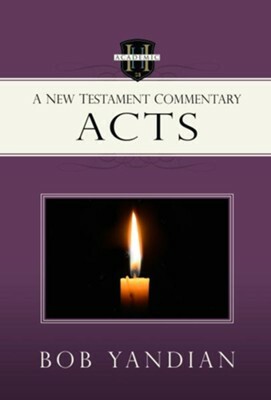 In Acts: A New Testament Commentary, pastor Bob Yandian outlines, verse by verse, the exploits of men like Stephan, Peter, and Paul, men hailed both as gods and heretics, bent on uprooting the binding vines of religion and philosophy to plant the kingdom of God. From honest appraisals of the early congregations to detailed descriptions of the cities Paul evangelized, Yandian walks readers through the thoroughly exciting and perilous adventures of the early church. Verse by verse, Bob Yandian outlines the exploits of men like Stephan, Peter, and Paul, men hailed both as gods and heretics, bent on uprooting the binding vines of religion and philosophy to plant the kingdom of God. From honest appraisals of the early congregations to detailed descriptions of the cities Paul evangelized, Yandian walks readers through the thoroughly exciting and perilous adventures of the early church. From 1980 to 2013 Bob Yandian pastored Grace Church, with a vibrant and strong congregation in his hometown of Tulsa, Oklahoma. For 33 years he hosted a weekly teaching radio broadcast called Precepts with Bob Yandian. Bob is widely acknowledged as one of the most knowledgeable Bible teachers of this generation. His practical insight and wisdom into the Word of God has helped countless people around the world to live successfully in every arena of the daily Christian life. In addition to the sale of over 200,000 books, CDs, and tapes world-wide, more than 22,000 books, tapes, and CDs have been donated to Bible schools, missionaries, prisoners, and people in need throughout the United States and around the world through Bob Yandian Ministries. Bob attended Southwestern College and is also a graduate of Trinity Bible College. He has served as both instructor and Dean of Instructors at Rhema Bible Training Center in Broken Arrow, Oklahoma. Bob has traveled extensively throughout the United States and internationally, taking his powerful and easy to apply teachings that bring stability and hope to hungry hearts everywhere. 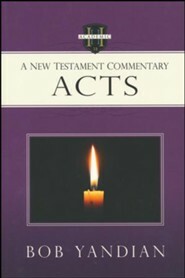 He has authored over thirty books and has been called "a pastor to pastors." Bob and his wife, Loretta, have been married for over thirty years, are the parents of two grown married children, and have five grandchildren. Bob and Loretta Yandian reside in Tulsa, Oklahoma. I'm the author/artist and I want to review Acts: A New Testament Commentary - eBook.